My last holiday was special for several reasons. Firstly, it was the longest time I spent in Lithuania since I'd moved to Turkey ( even 4 weeks! ), secondly, it was the first time when my husband visited my native areas, that's why we spent most of the time travelling round Lithuania. Even now when I look at the photos we took, it's quite difficult to choose those which would show the beauty of my favourite spots in Lithuania ( we took more than 2000 photos!!!). Anyway, below you can see collages of the most favourite places for my husband and me!!! My husband joined me in Lithuania 2 weeks later but still we managed to look around, even if it ment spending much time on the road. That's the advantage of a small country - you can go and come back home ( to my mum's pace) the same day!!! So Lithuania is just a bit more than 65 thousand square kilometres with a population of 3,48 million people, almost 540 thousand live in the capital city Vilnius. 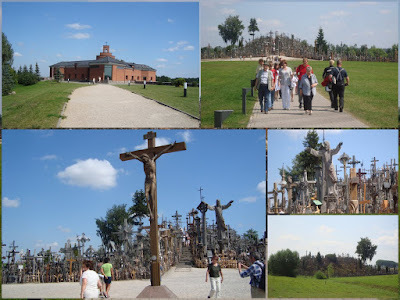 The first place we visited was the Hill of Crosses situated in the north west part of Lithuania, about 8 km from a city of Siauliai. I would say that this hill standing in a plain field shows Lithuanians' Christian devotion and national identity. From 1944 to Lithuanian's independence in 1991 this hill of Crosses was leveled several times by Soviet Union Officials, still everytime crossed were rebuilt by worshipers as a proof of nationalism. Nowadays this area is being visited by many pilligrims and each day hundreeds of new crosses are hanged or built. 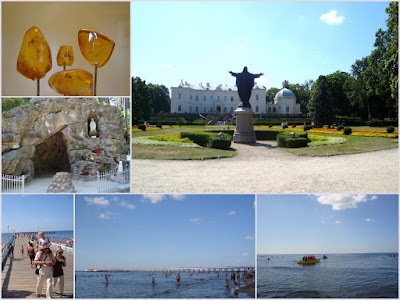 Another place really worth visiting is Palanga. It is a town on the west of Lithuania and it is known for its sandy beaches and nightlife. But we went there for other reasons. First of all we visited Amber Museum which is surrounded by Palanga Botanical Park with its lovely trees, ponds and statues. Amber museum is housed on the estate of Tiskeviciai palace. The exposition includes numerous amber pieces many of them have inclusions of plants or insects. Not far from the Amber museum, we visted Birutė's Hill. It is the highest dune at the seaside in Palanga and it is believed that in 14-16 centuried this area was used as pagan sanctuary and observatory. Birutė (died in 1382 or in 1389) was the second wife of Kestutis, Grand Duke of Lithuania, and mother of Vytautas the Great. The story of her marriage to Kęstutis still is a romantic legend in Lithuania.It is said that Birutė was a priestess and served the Pagan gods by guarding the sacred fire. When Kęstutis heard of her beauty, he visited the shrine and asked her to marry him but recieved a refusal because she had promised the gods to guard her virginity until her death. Kęstutis then took her by force to Trakai and threw a big wedding. A more recent place to visit in Palanga is Palanga Bridge which is a perfect place to watch the sunset or sunrise. And of course the liveliest street of Palanga - Basanavicius street with all its bars, restaurants, cafes and many other things. Straight from Palanga we went to Klaipeda and stayed there overnight. The other morning we headed for Smiltyne and Nida. Smiltyne, Juodkrante and Nida are beautiful places next to Klaipeda just over the Curonian lagoon. So we took a ferry got into Curronian Split ( Kursiu Nerija) which is one of the most amazing places in Lithuania. Our first stop was Lithuanian Sea Museum and Dolphinarium with lots of sea animals including seals, sharks, pinguins and of course wonderful Dolphin show!!! Later on we moved to Nida which is about 43 km from Smiltyne and we had to cross some lovely fishermen villages nowadays popular with holidaymakers. 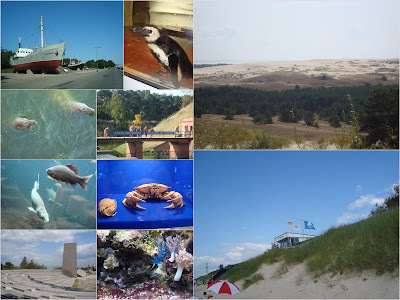 In Nida it was great to see wonderful sand dunes, lovely little holiday houses and of course our cold Baltic Sea!!! 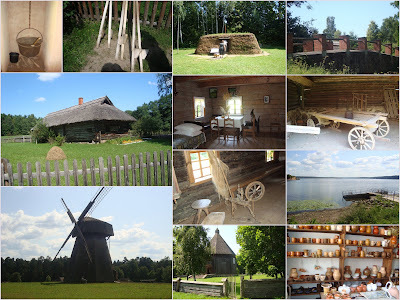 If you ever go to Lithuania, another place that should be visited is the Open Air Museum in Rumsiskes. This is a place where you can really experience the life during the last two centuries. The exibition of this museum include dwelling houses, farmstead buildings and folk art monuments transferred from all ethnographic regions of Lithuania - Aukštaitija, Žemaitija, Suvalkija and Dzūkija, and reassembled in a 175-ha area, in a beautiful location near the Kaunas Man-made Sea and Praviena rivulet. During the school year many educational programmes are organized to help to learn how cheese was produced, how clay pottery was made or how a scarf can be weaved. It's really worth going there for a day and making a picknic in any lovely shadow. And that was exactly what we did!